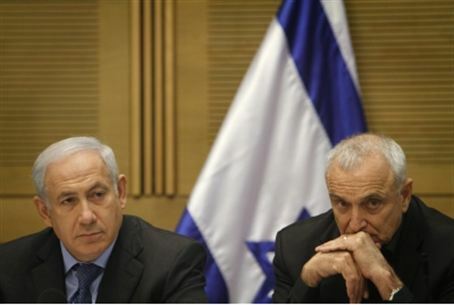 Ministers Aharonovich and Ayalon join Prime Minister Netanyahu in threatening Hamas. Aharonovich called Hamas's behavior "barbaric" and Ayalon said the terror group only understands force. Aharonovich toured the Gaza Belt communities as terrorist missile attacks continued. He met with the head of the Sha'ar Hanegev local authority, Alon Shuster, and the head of Merhavim local authority Avner Mori, and offered them assistance in dealing with the security situation. He also visited the spot where a Grad missile hit in the Negev town of Ofakim. "There is no immunity for anyone in Gaza and they must know that we will hunt them down, one by one, until we find them. We will know how to reach their hiding places in the ground. The IDF has the means for that and we will use them," Aharonovich declared. The final stop on the minister's tour was Soroka Hospital in Be'er Sheva, where he visited Daniel Viflic, who was critically wounded when terrorists fired a Kornet anti-tank missile at the school bus he was in. "Hamas behavior is barbaric," he said outside the hospital. "Everyone knows that a yellow bus is an international marking for a vehicle transporting children, and firing at it is a heinous crime and a crossing of a line." "Hamas has no compunctions but we will know how to react with the force that the IDF possesses. We will not the abandon residents of the South and we will hunt down Hamas and the terror groups wherever they may be." Foreign Minister Danny Ayalon said Sunday that "terror will never defeat us. The nation of Israel will always know how to close ranks in the face of threats, and we are all with the residents of the South. Unfortunately Hamas only understands force, and Israel knows how to make Hamas understand that terror will have a steep price tag." Regarding the planned "Marmara 2" flotilla to Gaza, Ayalon said Israel is focusing its effort on preventing the flotilla from leaving port and that it is acting on the diplomatic front vis-a-vis the other countries in the region to ensure that they do not allow "provocative and illegal flotillas" to leave their ports. Prime Minister Netanyahu made a relatively forceful statement at the opening of the Cabinet session Sunday. "Regrettably, our enemies and those who seek Jewish lives have not gone from the world. But the State of Israel exists and it knows how to defend itself from evil designs and we say: No more! We say more than that: The Jewish People live!" "I said that our enemies have not gone from the world. This morning, I spoke with Yitzhak Viflic, the father of Daniel, the pupil who was wounded in the criminal attack on a children's bus. Daniel is fighting for his life. We, along with the entire nation, pray for him. "The IDF has had two major achievements in the past few days, one in the area of defense, the other in offensive operations. In the area of defense, Israel scored a significant and impressive success when the Iron Dome system intercepted missiles. This echoes around the world, including in the European countries that I visited. "The impressive significance of this achievement notwithstanding, it is clear that it is only a partial response. It is clear that an offensive response is also needed. Here as well, the IDF was impressive when it struck hard at Hamas and the other terrorist organizations, in terms of both lives and equipment, in response to the criminal attacks against us. "Over the weekend, I held discussions with Defense Minister Ehud Barak, IDF Chief-of-Staff Lt.-Gen. Benny Gantz and ISA Director Yuval Diskin, and our policy is clear: If attacks on Israeli civilians and IDF soldiers continue, the response will be very harsh."